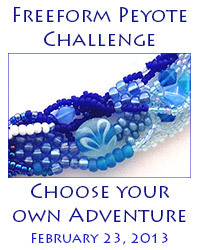 Autochthonous Evolved - Jewelry and Lampwork Beads: 2013 Art Charm Swap REVEAL & Beads of Courage AUCTION! 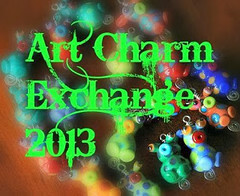 2013 Art Charm Swap REVEAL & Beads of Courage AUCTION! Buckle up, ladies and gents because today is going to be a festival of eye candy! Today is the day I get to reveal the eleven charms I made for the 2013 Art Charm Swap hosted by Jennifer Cameron of Glass Addictions, as well as the nine lovingly handmade art charms that I received as part of the swap. Every artist in the swap made ten charms to swap and one charm to auction off to raise funds for Beads of Courage, the charity that provides morale-boosting beads to help children receiving life-saving treatments in hospitals all over the US to help them document their treatment journey and to remind them of their courage. So please go take a look and, if you like something, please bid. If there's something you can't live without, shop now, because there's a $20 Buy It Now option! 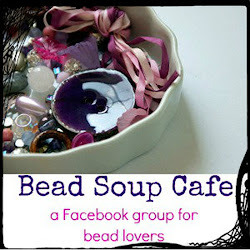 All proceeds are being donated to Beads of Courage. Jen wanted you to know that she's combining shipping. If you win a BIN, you have to pay immediately. If you are also participating in bidding, she can hold your BIN (Buy It Now) until the end and not charge additional shipping. But if you don't message her, she will ship within a day or two. Also the auction will be staggered. Each listing will be 2 minutes apart to facilitate bidding on multiple items. Also there will be batches this morning, the second batch will stagger start Saturday morning from 9am to 9:45-ish EST, and the third batch will start Sunday evening at 8pm-8:45-ish EST. I'll start with the beads that I made for this swap. 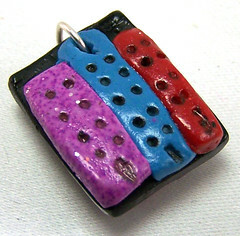 As a lampworker - who really loves doing stringer decoration - I knew that would be the focal point of my charm design. I knew I wanted my charm to be more special than just putting my bead on a headpin with fringe. Don't get me wrong, I love - loooooooove - fringe, mostly because of the movement it adds to a design, but I use that element a lot in my work and I really wanted this charm to be unique. So, I decided instead to make my bead do the moving. 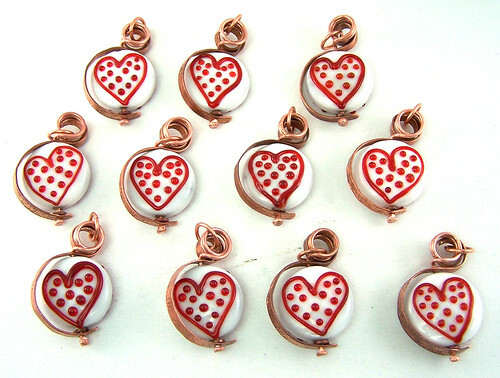 As I pondered the theme - love - a little more, I decided to create a bead that expressed the idea, Love Makes The World Go Around, like a globe on its axis, but with hearts dominant to clearly communicate the theme. To create the metal frame I ran some 14 gauge copper wire through my rolling mill and stamped "LOVE" on what would become the spine of the frame, again to reinforce the theme of LOVE making the world go around. I made some long 18 gauge headpins, flattened a bit like the base of a globe stand, to string the bead onto the frame and square wire copper jump rings to help reduce the friction of the bead against the frame to help it spin better. Then I used my bail-making pliers to create the loop on top and added the jump ring. Finally I soaked the whole thing in liver of sulfur to add some patina to the metal, then put it all in my tumbler with stainless steel shot to polish and harden the metal. Since I know that not everyone knows exactly what lampworking is, or the process, I made a video of me making one of the beads for the swap and auction so that you could see! 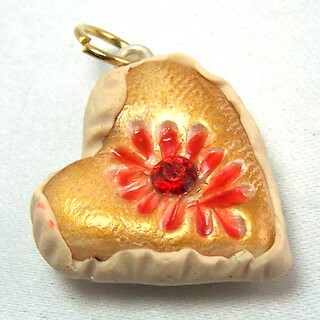 Alenka is a polymer clay artist. I really like the gold and the rhinestone on this charm. It makes it feel regal. Tangentally, I love that her business cards say that her work is handmade in Slovenia. Caroline is a ceramic artist. When I first saw this I was immediately struck by the clean lines and color, making the heart of gold stand out. 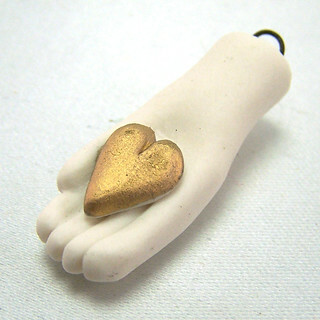 It's an elegant charm and her talent in sculpting such a small form cleanly stands out. 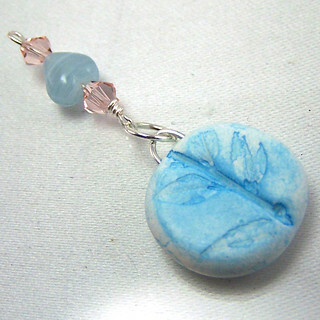 Cassi, who donated a bunch of polymer clay beads she made with her daughter during last year's Art Charm blog hop made a sweet little impressed-leaf charm this year with delicate pink Swaroski crystals and a small matching blue heart. 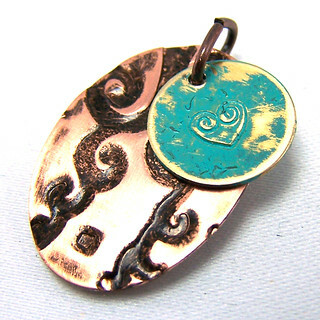 Cheri made a layered metal charm using a darkened and polished embossed copper oval and a small brass circle with a stamped heart and happy turquoise blue patina, which really makes the heart jump out at you. 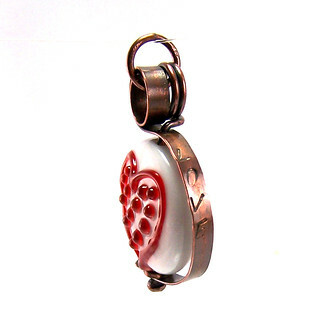 Lennis made this really creative two-sided resin pendant in an antique brass frame. 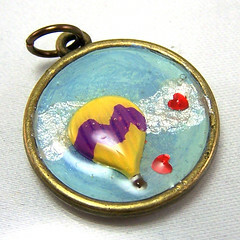 The tiny red hearts add a ton of sparkle on top of the painted blue background and opalescent silver clouds, and the hot air balloon adds such a fun pop of color! Those of us in the ISGB know that last year Mallory donated more lampwork beads to Beads of Courage than any other lampwork artist in the country, so it was a surprise to see that she's branching out into polymer clay! Her color sensibility diverges from her more subtle lampworking palette with these boldly contrasting colors. 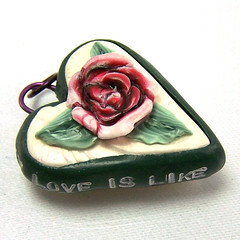 Monique's talent shows in every tiny detail stuffed into this lovely charm, from the color palette, the finely sculpted rose and leaves, the carefully colored stamped lettering on the sides spelling out "my love is like a red red rose", to the textured and color-highlighted back. Lovely! 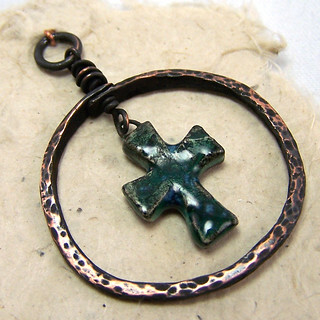 Terri created this nostalgic piece with heavy, textured and forged copper, and heavily blackened metal, and glazed ceramic cross, like it is an artifact that's just been plucked from the courtyard of an old Spanish church. This definitely appeals to the archaeologist in me. Rita, a.k.a. Toltec Jewels, was the obvious over-achiever in this swap and I was lucky enough to receive her three, yes three, fun charms that she made for this swap and all three are multi-layered feasts for the eyes! 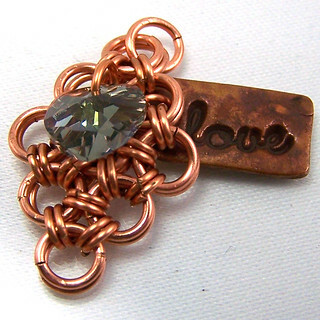 She named this first one Love is a Diamond in the Rough and it includes a Kristi Bowman Designs custom made tag, copper chainmaille diamond, and Swarovski Black Diamond crystal. I love that it has a rustic vibe that complements the diamond-in-the-rough theme for this charm. 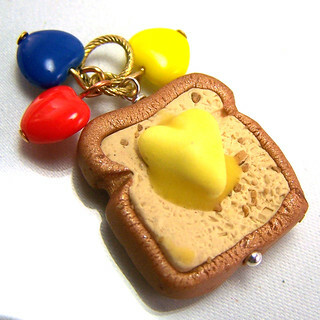 Rita named this second charm Love You Like Sliced Bread and features an amazingly textured and realistic polymer clay bread slice and melted butter custom made by Amazing Designs by Marlene Cupo. 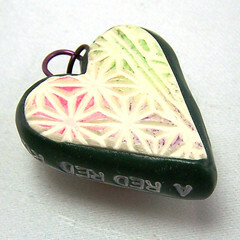 This one almost doesn't even need the colorful Czech pressed hearts that embellish this charm. 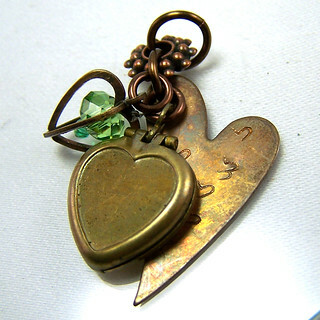 The title of this third charm is Love is a Keepsake and combines a trip of warm antique bronze hearts, including an Olla Podria vintage brass heart locket, Olla Podria vintage brass heart cage with Swarovski heart chakra green crystal rondelles, and heart stamped brass hearts by Margot and Andrew Potter. I wanted to thank each of these passionate artists for sharing the love of their craft with me, for each of these charms is a window into their creative soul. What I particularly admired was how I could see the touch - often literally - of the artist in every charm I received. The art that we craft - especially when it's for a children's charity - calls us to be our best, and I'm sincerely thankful to everyone for sharing their heartfelt best with me! The full list of dedicated artists who donated charms for this swap and auction. Please take a look at their blogs and see what they made, too! And remember, you can bid on any of the charms you love! Phew! Are you tired, or excited? Excited I hope! Which of the charms here is your favorite? Are you going to go bid on a charm?! I hope you do. They make great gifts and the proceeds go to a great cause! Love your charm! 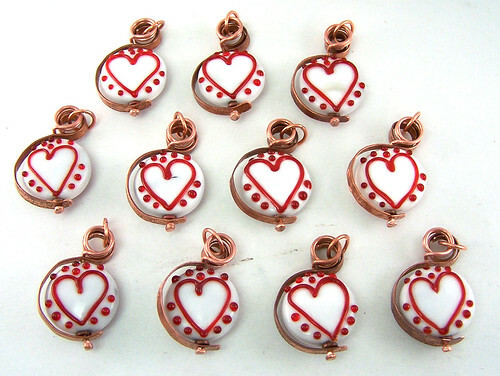 Love your kind and generous comments about the charms you received. Love your photography! Thank you so much, Susan! Your kind and thoughtful Facebook comments have been a highlight of this Exchange! I think the structure and theme of your charm is just brilliant! I kept one in my lot of charms....And I appreciate the stringer work. I'm not a fan of drawing with stringers :-) Thanks so much for participating and for the extra effort to raise money for Beads of Courage. Beads of Courage is an important organization and I'm always happy to donate and lend my support whenever I can! Julie, your post is so jam-packed with amazing info I just know I'll have to come back for a second look. I just love the clever engineering of the spinning heart/globe and the cool illusion of the jumping dots (my geeky soul grooves on that stuff). Your design shows not just beauty but brains! :) I don't know whether to say thank-you, or I'm sorry :) There is a lot to process here. But, I'm thankful that you liked my charm! It was a labor of love combining all sorts of techniques that I love and I'm so pleased that you like it! lol. I noticed the blog background on yours, too :) Thank you so much, Terri! I'm so pleased that people think it's neat! Can't tell you how much I looooved your charm. Love the thought out sentiment behind it...and it spins! such fun! Such a lot of talent, effort and creativity! I plan to make a necklace with it. One of my faves! Thank you so much..glad I own one now. Yay! I'm so glad you get to play with one! I was so excited with the idea once it all came together and I'm so happy that you enjoy it, too! Do be sure to share what you make! I'd love to see it! these little charms are adorable! Thank you, Cheryl! I had to laugh a little at your :little" comment because I was a little worried Jen'd yell at me because they definitely flirt with the upper size limit! Julie, I was so in awe when I opened my package of charms and saw yours! What an amazing creation! As Monique said, what a feat of engineering! This is a truly special piece and I'll be thinking long and hard about what to create with it! Oh! Hooray! I'm so pleased, Lori. It means a lot to me that these charms are finding good homes. I put a lot of time and love into them and am glad it shows! :) Yay! Be sure to show what you end up making! I want to see!!! Julie - your charms are beautiful both in design and execution and I am so happy to have found one in my package. Thank you. Thank you, Lesley! 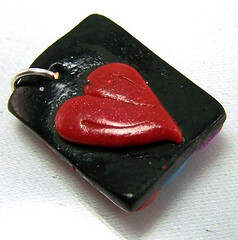 I've always loved your work, so I'm especially pleased that you like the charm! It means a lot to me that you can see and appreciate the love and energy that went into each charm! Julie, the idea behind your charms is so unique and adorable! 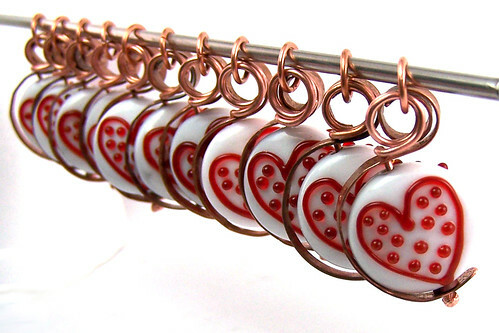 I love how the dots 'fly out' of the heart :) Your charms are absolutely gorgeous - great job! Thank you so much, Alicia! Everything about this charm was fun to create! I'm so glad you like them! I had one snagged right out from under me with BIN. Aargh! Oh No! :( It does make me happy to hear that you wanted one that much though! I'll have to think about making a holiday series after Thanksgiving and donate some of the proceeds to BOC! 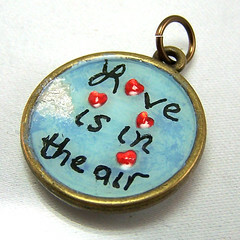 Great idea, lots of meaning, beautiful charms, I wish I could have gotten one at the auction!